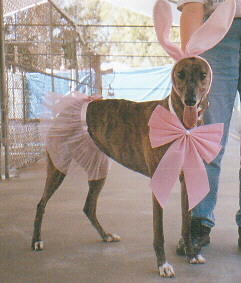 I've been the proud parent of six adopted ex-racers, rescued and placed by the Greyhound Adoption Center in San Diego. 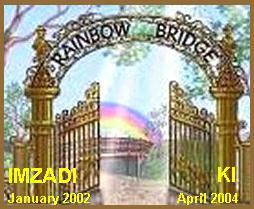 Imzadi, Ki and Angel - my original three girls - were followed to the Rainbow Bridge in 2007 by my three-legged male named Braveheart, a loving, playful dog that actually exhibited a sense of humor. In the spring of 1999, three-year-old Bella Braveheart, a beautiful white and red boy, had begun a promising racing career in Tucson with trainer David Blair. Then one night at the track his future was changed in an instant. Bumped against the rail, Bella Braveheart suffered a severe compound fracture in a rear leg. The leg was shattered so badly it could not be repaired. 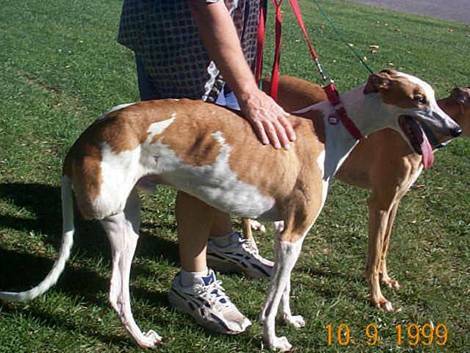 David couldn't face putting his greyhound down, so he chose to have the leg amputated and take the dog home with him to heal. 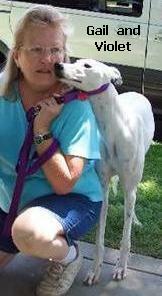 Braveheart arrived at GAC that summer, and charmer that he was it didn't take him long to find his new home. 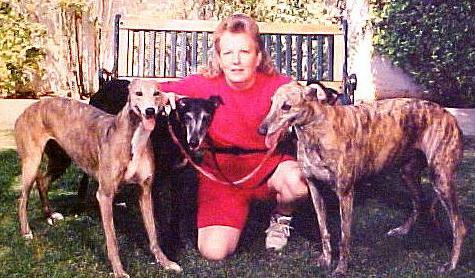 Gail Blank of Fresno had three other greyhounds at the time, all of them special needs dogs, and Braveheart fit right into the mix. He had no trouble with steps or the dog door, and it seemed almost as if he'd been born there. 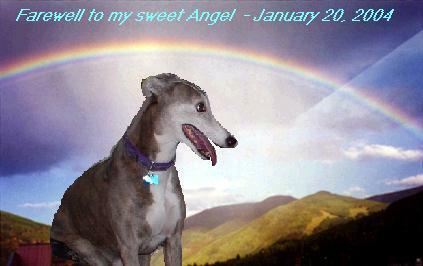 Gail says he was the best dog she ever had - sweet, loving and smart. He was a real gentleman and a Show and Tell star. One year at the Clovis Big Hat Days a little boy came up and softly put his arms around Braveheart - Braveheart stood quietly looking down at the little boy, and Gail noticed that they had exactly the same shade of red hair. She will carry that mental picture forever. Gail deeply loved her beautiful boy and he will be sadly missed. Due to the mass destruction of these dogs when their racing careers end (i.e., they stop making money), many organizations have been set up to rescue them. These magnificent creatures are brought up to health and loving homes are found for them. Be sure to visit the adoption sites on the links page. If you're concerned about the plight of retired race dogs but can't adopt one, you can sponsor a dog who's awaiting a home through the Greyhound Adoption Center. For a minimum of $10/month, you'll help support these sweet dogs who are carefully being brought up to adoptability. Shown to the left is one of the dogs I chose to sponsor, Strattus. This once-shy girl slowly came out of her shell and, as you can see from this Easter photo, began to relate pretty well with humans. For information on sponsoring a greyhound, call toll-free: 1-877-478-8364. Males are 26 to 30 inches high and weigh 65 to 85 pounds. Females are 23 to 26 inches high and weigh 50 to 65. 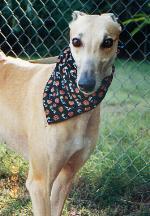 Greyhounds come in many colors - brindle, black, fawn, white or a combination of these colors. The "grey" in "greyhound" did not orginate from the breed's color. As pets, Greyhounds eat no more than any other dog of comparable weight - 4 to 6 cups of dry kibble a day. They also love rice and vegetables in their food. Greyhounds adapt well to life as a pet and need no more than a romp in the backyard or a daily walk or two to keep them fit. Despite the fact they're the fastest dogs on Earth, they're not usually hyper. Since they are sighthounds and are oblivious to verbal commands when they move toward an object on the horizon, Greyhounds must never be allowed outside unless they are on a lead or in a completely fenced or enclosed area. The automobile is the Greyhound's "unnatural" enemy and neither the dog nor driver can react to a speeding Greyhound in time to avoid a lethal collision. Greyhounds have little oil in their skin so they have minimum "doggy odor" and only need a bath when soiled. 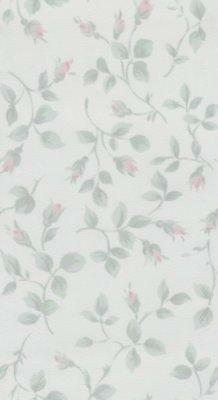 Docile in nature, Greyhounds are the original "couch potatoes" and most get along well with other pets and children.